Spencer and M17, along with SledgePro Media partner Phillipa Sledge were investors and general partners in a magical musical called SERRANO. The anchor, general partners are producer Mark Wolper and two senior EXTRA Producers, Steve Sunshine and David Geha. The director of this show is Tony nominated Joel Zwick ("My Big Fat Greek Wedding"). After 3 successful staged readings in Los Angeles and 2 in NYC, the producers brought the musical comedy to a select group of regional theaters beginning in Los Angeles, California in 2017. 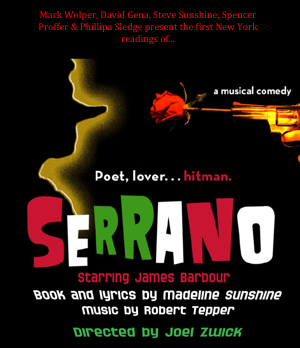 "Set in the mob in New York City’s Little Italy, “SERRANO, Poet, Lover …Hitman” is a musical comedy based on the French classic, “Cyrano De Bergerac.” Serrano D’Angelo is a self-taught renaissance man and the enforcer for the Reyo crime family. Don Reyo seeks Serrano’s help in educating his nephew Vinnie, a handsome, but crude and foul-mouthed young mobster. The goal is to seduce the beautiful and refined daughter of a judge who sits on a case involving the Family. If Vinnie succeeds, the judge would be compromised and have to recuse himself from the case. And the next judge in line is owned by the Don. Serrano accepts Don Reyo’s challenge only to discover that the beautiful young woman Vinnie must seduce is Rosanna with whom Serrano’s been secretly been in love all his life." FILM: directed “My Big Fat Greek Wedding” – highest grossing romantic comedy of all time – produced by Tom Hanks and Rita Wilson. Also, “Fat Albert” with Bill Cosby and “Elvis Has Left the Building” with Kim Bassinger. TELEVISION: Hollywood’s most prolific director of episodic television. Has directed over 500 episodes plus 21 pilots which have gone on to become regular series. Shows include “Laverne and Shirley,” “Mork and Mindy,” “Bosom Buddies,” “Webster,” “Perfect Strangers,” “Full House,” and many more. Jessica Rush as Rosanna – One of the most beautiful and talented actresses in theatre, Jessica is best known for her lead roles in “Guys and Dolls” and “Jersey Boys” which is currently on Broadway. Michael Nouri – as mob boss Don Reyo: Star of stage, screen and television, Michael is best known for starring roles in “Victor Victoria” on Broadway; “Flashdance” in film; “Damages” opposite Glenn Close on TV. LYRICIST: songs for “Sesame Street,” theme songs for TV series including “Webster,” and “The People Next Door.” Pop songs recorded by Dr. John, Paul Anka, Janie Frickie, many others. FILM: Screenwriter: “Say Nothing,” starring William Baldwin and Nastassja Kinski; Co-Writer with Blake Edwards, “Son of the Pink Panther,” starring Roberto Benigni. SONGWRITER: Wrote hits for many artists including Pat Benatar, Australia superstar Russell Morris, Danny Tate, Paul Anka, and the mega hit “Into The Night” which garnered him a Grammy nomination. Most recently Usher has picked up one of Robert’s songs for his new album. SONGS FOR FILM and TV including “Rocky IV,” “Say Nothing,” and many others. AS PRODUCER AND MIXER has worked with some of the top producers including Joe Chicarilli (Elton John, Frank Zappa, U2), and collaborated with some of the biggest hit makers including Jeff Silbar (“Wind Beneath My Wings,” and Steve Pocaro from Toto.) In addition Robert has released two albums of his own and was the lead singer for the revamped Iron Butterfly. SERRANO Stage Play Producer Mark Wolper, Spencer Proffer, Director Joel Zwick and Producer Phillipa Sledge celebrate workshops in NYC.